This three-piece LED candle set exhibits 12 different lights. 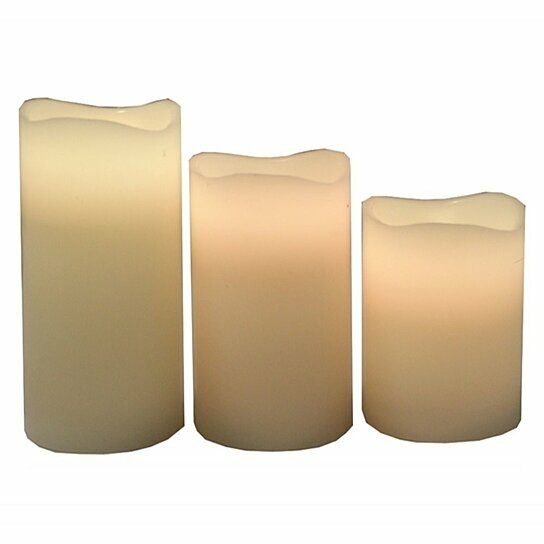 These candleholders are wax made and look exactly similar to any natural candle. Great feature about this candle is they will last long. These are drip less and provide sturdy glow all the time. Change the light according to the setting of the room. You can doll up your living room, bedroom or kitchen interiors with these candleholders. These candle will spread warm and make the boring setting turn relaxing. This product can expose you to chemicals including Benzene, which is known to the State of California to cause cancer or birth defects or other reproductive harm. For more information, go to www.P65Warnings.ca.gov. These candle suits both indoor, outdoor space. Adorn it in your house, restaurant of cafe interior.